Providing membership in an organization that promotes the conservation and preservation of wildlife and its Habitat and the sport of hunting. Jewelry Magazines dealing with hunting; cookbooks; periodical newspapers/newsletters; magazines for kids Association services, namely promoting the interests of the members of the association and public awareness, concerning issues of wildlife, conservation and hunting. On Wednesday, July 30, 2003, a canadian trademark registration was filed for the above pictured logo by SAFARI CLUB INTERNATIONAL 4800 West Gates Pass Road, Tucson, Arizona, 85745-9490, UNITED STATES . The Canadian IP office has given the trademark application number of 1184733. The current status of this trademark filing is Registration published. The correspondent listed for is BERESKIN & PARR LLP/S.E.N.C.R. 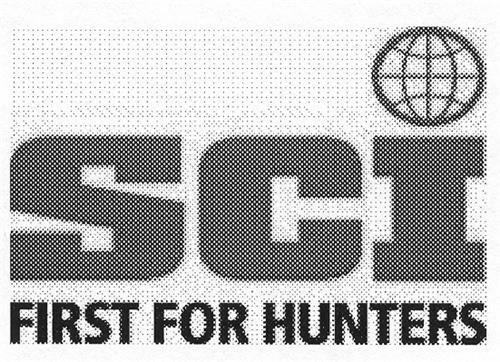 of SCOTIA PLAZA, 40 KING STREET WEST, 40th FLOOR, ONTARIO, CANADA M5H3Y2 The trademark is filed in the description of Providing membership in an organization that promotes the conservation and preservation of wildlife and its Habitat and the sport of hunting. , Jewelry , Magazines dealing with hunting; cookbooks; periodical newspapers/newsletters; magazines for kids , Association services, namely promoting the interests of the members of the association and public awareness, concerning issues of wildlife, conservation and hunting. .
Mark Disclaimer: The right to the exclusive use of the word HUNTERS is disclaimed apart from the trade-mark. (7) Letters surmounted by a sign of disproportionate size -- Note: Includes, for instance, a letter i surmounted by a disproportionate dot, by a star or a flower. (8) Letters linked to a figurative element -- Note: Letters representing a human being or a part of the human body, an animal or a part of an animal's body, a plant, a heavenly body, a natural phenomenon or an object are classified in division 27.3. (1) - Providing membership in an organization that promotes the conservation and preservation of wildlife and its Habitat and the sport of hunting. (4) - Association services, namely promoting the interests of the members of the association and public awareness, concerning issues of wildlife, conservation and hunting.